Ads24 is pleased to announce the winners of its #Ads24Diski18 online tournament, which was live on its website from July to 3 August. Nikki Lewin (Alphabet Soup), Wilise Laurent (Dentsu Aegis), Marizanne Scholtz (HAVAS), Keeva Arnold (TBWA Hunt Lascaris), Ilse Hayes (CARAT), Ricardo Lopes (OMD) each walk away with a PS4 console and official 2018 FIFA game. The Ads24Diski18! campaign aims to create awareness among national media agencies around the enormous reach and potential of Ads24’s mass market titles: Soccer Laduma, Kick Off, Daily Sun and Die Son. 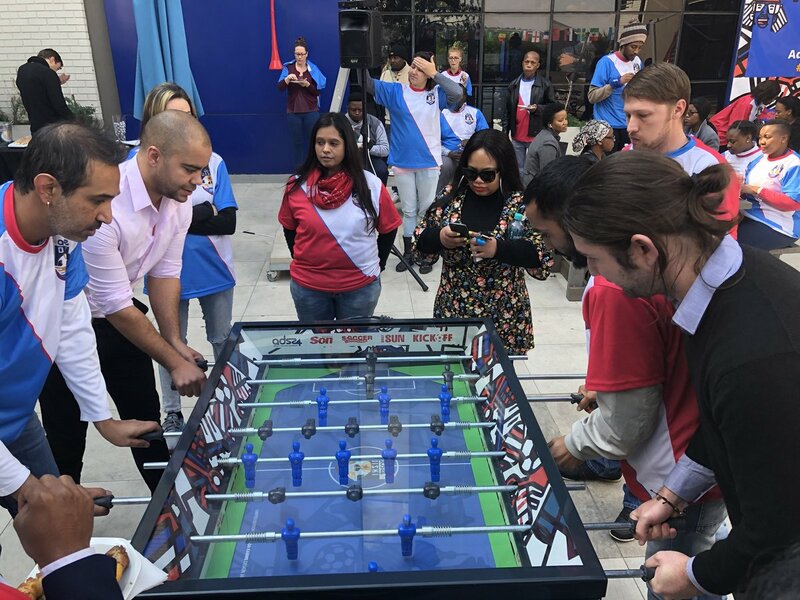 #Ads24Diski18 held activations at a number of agencies across Johannesburg and Cape Town, and in the cases where Ads24 wasn’t able to visit an agency, desk drops featuring insights and an interactive game, as well as an invitation to take part in the online tournament, were delivered. Snippets of information about Ads24’s mass market titles, Soccer Laduma, Daily Sun, Kick Off and Die Son were presented during gameplay and when the players shared their results on social media. The objective was to get agencies to experience the market first-hand and to engage with the idea of thinking beyond just print or digital advertising seeing as Ads24 is always exploring ways to engage in a meaningful and memorable way with advertisers. The success of the campaign was clear from the numbers. Last year 2,530 games were played with over 13,337 goals, but this year the figures rose to 2,741 with a staggering 22,060 goals scored. Agency contenders were also keen to share their results on social media, with more than double the amount of shares on twitter than in 2017 (776 shares on twitter compared with last year’s 436 shares). Remember to follow Ads24 @Ads24_News.